A round-up of all improvements and changes to the Buzz platform in versions v3.0.98 & v3.0.99 available on February 7, 2019. Due to lack of use and a change in Yahoo's support of it, Buzz's RSS Feed activity type will be removed on 2/14/2019. Added the font Comic Sans to the rich text editor. Updated all screens in the Course and Users tools in the Admin app. Updated the Score column on the Student > Grades screen to display current scores in form as set by the teacher in Course Settings > Gradebook options > Course grade view. Displayable options include Points, Percentage, and Letter grade. If you choose multiple formats, Letter grade takes priority, then Points, and then Percentage. Fixed an issue in the User Settings screen where navigating away from the page did not prompt to save unsaved edits. Fixed an issue where users were not able to upload Rubrics as XML files in Admin > Domain Settings. Fixed an issue in the Admin App's details screens for objective sets and objective maps where pressing Enter in an editable field would attempt to navigate away from the screen. Fixed an issue where the "Inherit option" was not being saved when selected in the Objectives Details screen. Added a message letting admins know when a search in the Users tool yielded more than 500 users: "Showing top 500 results; filter to narrow your search." Fixed an issue where an error message in the Admin > Users tool was appearing behind the window it was intended to help the user fix. Fixed an issue where the Admin > Users tool would continue to show two pages of results after a user had filtered the results to a number that fit on one page. Fixed an issue in the Course Settings editor where an author was sometimes prompted to save edits when leaving the screen when there should have been no prompt. Fixed an issue where users would not see a confirmation box when importing data. Fixed an issue in the Advanced Assessment Settings editor where the editor would not auto-correct the securitylevel setting on an activity. Note: This fix does not fix existing activities with invalid settings. For activities that have the bad behavior, open the editor and then click "Save" to reset the setting. Fixed an issue in the Reports tool for teachers where the Mastery tab erroneously appeared in courses that have no defined learning objectives. Updates in version 2019.02.06.3589. Learn more. ListCourses: Fixed an issue where using the query function for multiple meta- attributes could fail. 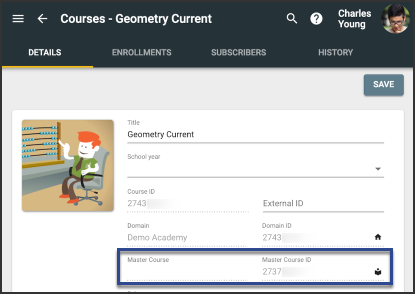 Yesterday, when I looked up a course and went to the details page, I could see if that was the master course, or if it was a derivative copy of another course (and what that other course was). I have a screenshot I took for a colleague recently with that information on it. Is there a different way to look this up? Can we get this back on the Details page? I agree with Chad that this is extremely useful information to have. There was also an option in the three dots that were here before to go to that master course and one to go to the domain of the master course and maybe the course's domain. Those were extremely useful features that I used all the time. Can we please have those back too? On another note, I prefered having the filter box always present on the courses and users pages. I can live with the fact that we need to click on the funnel to activate the tool as long as it remembers that setting and always returns us to that state like most of the rest of the site does. It seems to be doing that whenever I return to the Courses page, but every time I click on a course and view its enrollments, I need to click on the funnel to activate the filter box. I would prefer it if the system just remembered that I have the filter tool activated whenever I go to view Enrollments. It's just one additional unnecessary step. Chad and Jeremy, I really appreciate your feedback and patience with us. I have relayed your feedback and will let you know any more information once I have received it. After the update on the courses page, the courses are listed by default in the order of course ids. It would be really helpful if we can revert back to the earlier appearance where courses list (on admin view) by default were arranged in the alphabetical order. Even if we can arrange by name, we are having to do this every time we search for a course which is cumbersome. Also same comment on Users page. Thank you for the feedback, Varshini. We are looking into this. Jeremy, in the next system update, the Filter bar will always be displayed. In other words, you will no longer have to click a button to display it. Varshini, also in the next update, the default sort will be the course title.